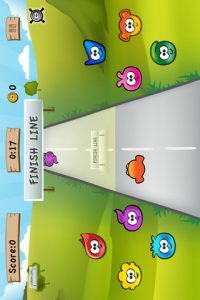 Catch the Face, developed by LL Technologies, is a fun little iPhone game that blends the best of racing and matching games. Requiring both precise timing and quick thinking, this unique title starts off slow and gets more challenging the longer you play. 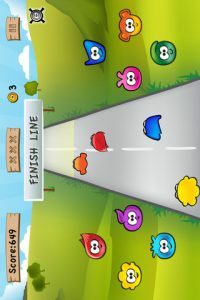 The game mechanics in Catch the Face are very simple. As different “faces” come flying down a race track, your job as the player is to tap on the corresponding face on the sidelines. But you can’t just tap on the matching face right away: you need to wait until it’s in the sweet spot just before the finish line. Waiting for that moment where the face is in the sweet spot can be highly frustrating, however. While this iPhone game isn’t targeted solely at kids, Catch the Face is suitable for younger gamers. The App Store rates Catch the Face as a title that’s appropriate for kids aged 4 and up. Catch the Face has 4 different game modes. Classic mode challenges you to match as many faces as possible with no time limit: however, you are only allowed to make 3 mistakes. Classic Time mode is the same challenge, but with no strikes and just 90 seconds to complete your best score. Challenge Mode mixes things up by making all of the faces the same color, while Challenge Time mode forces you to have that attention to detail and make as many matches as possible in 90 seconds. 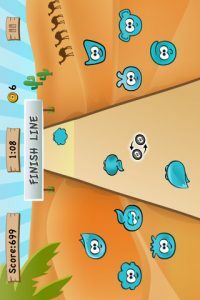 Don’t be fooled by the cutesy graphics and simple interface: Catch the Face is surprisingly addictive and fun iPhone game. With awesome, up tempo music to enjoy while you play, Catch the Face is tons of fun whether you play it with the sound on or off. Catch the Faceis compatible with iPhone 3GS, iPhone 4, iPhone 4S, iPod touch (3rd generation), iPod touch (4th generation) and iPad. Requires iOS 5.0 or later. A small expedite fee was paid by the developer to speed up the publication of this iPhone game review.